Watching the bright sunlight glint off the shimmering golden tiles of a Buddhist temple. Weaving your way through a busy night market smelling the aroma of spicy frying noodles and grilled meat. Walking barefoot in the sand as the turquoise Andaman ocean laps at your feet. Listening to monkeys squeal as they leap through the treetops while you trek through a humid tropical jungle. Thailand has so much to discover. 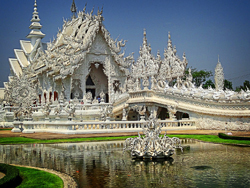 Thailand is one of the most popular countries in Southeast Asia to visit, for good reason. It offers delicious cuisine, beautiful beaches, lush and unspoiled jungle, amazing architecture and historical attractions and a fascinating cultural experience that is very different than anything you will experience in the West. Whether you are trekking in the remote northern highlands, snorkeling with colorful fish in the southern islands, visiting Buddhist temples or riding elephants at a nature sanctuary, your adventures in Thailand will be exciting, vivid and unforgettable. Plus – it’s known as the Land of Smiles because the people are so friendly and welcoming. 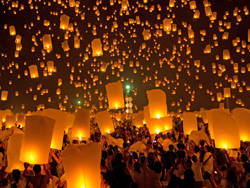 We can take you on an adventure in Thailand that will reveal to you the best that this beautiful country has to offer. When we customize your travel journey of a lifetime to Thailand, you can enjoy the wonders of Thailand, while being pampered with luxury accommodation and a friendly and experienced guide. Call Us now at 1.813.672.9384 to start planning your perfect Thailand Vacation! In Thailand there are essentially three seasons – the High Season, the Shoulder Season and the Low Season. The high season from November to March is when the weather is dry and sunny and it is the most popular time of year for visitors. Of course, since there is a higher amount of visitors this is also the most expensive time of year to visit. The Shoulder Season from April to June is the hottest time of the year. The temperatures in these months can get up to the high 30s and even into the 40s. However, it will be cooler on the islands thanks to the sea breezes. Visiting during the low season from July to October means that you will be experiencing more rain showers. This doesn’t necessarily mean it will be raining all day long – rather the rain comes in short, intense bursts and most of the day is still sunny and warm. There are so many things to see and do in Thailand. The first stop for many visitors is the Grand Palace, a glimmering golden landmark in bustling Bangkok. This enormous complex has several temples, throne halls and priceless works of art and you will need at least three hours to explore everything it has to offer. Chiang Mai, a city in the North of Thailand, is also worth visiting. Slightly more laid back than the crazy capital of Bangkok, it has a lot of beautiful historic temples, a fantastic night market and plenty of great restaurants. Plus, it is the gateway to exploring the lush and remote highlands of the north. 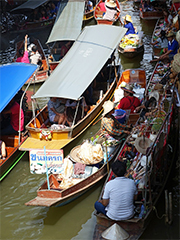 While in Bangkok you can also visit the Damnoen Saduak Floating Market, which is a very popular day trip from Bangkok. There you will find sellers pedaling their wares from floating boats in the river. You can also visit the temples of Lopburi northeast of Bangkok, which are known for their ancient ruins that are overrun with cheeky monkeys. One of the best opportunities to see the incredible natural beauty of Thailand is at Khao Yai National Park, which is a UNESCO World Heritage Site and the oldest park in the country. It is home to an incredibly diverse range of animal and place species including white handed gibbons and the giant hornbill. There are 50 km of hiking trails throughout the park, so you will have plenty of beautiful wilderness to explore. 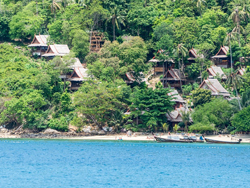 Of course, a trip to Thailand wouldn’t be complete without visiting one of the Thai islands. There are so many to choose from and each one is unique. If you are looking for a quiet and peaceful retreat you can head to an island such as Koh Lanta and if you really want to dance on the beach all night long you can head to one of the party islands such as Koh Phi Phi. Our packages are virtually all inclusive, so every detail is taken care of and any experience you want to have in Thailand can be easily arranged – just let us know! In order to enter Thailand you will need to make sure that the passport you use is valid for a minimum of six months. Visitors from the EU, Canada, the UK, Australia and the USA can visit Thailand without a visa for 30 days when arriving by air, 14 days by land border. You will need to have your return ticket or a ticket departing Thailand to your next destination booked, as you may be asked to show this. Although Thai immigration might not always check, your airline may check as they are responsible for your return flight if Thailand does not let you in. Avoid mosquito bites as much as possible by wearing long pants and long sleeves and wearing mosquito repellent, which is available at any pharmacy or corner store. Eating the street food is one of the best parts of exploring Thailand, but be sure to follow good practices of avoiding street cart where food is left sitting in the sun. Look for street stalls that cook the food fresh in front of you and are very busy. Stick to drinking bottled water, which is cheap and can be found anywhere. Before you visit Thailand the CDC recommends that you have travel vaccinations for Hepatitis A, Typhoid and Hepatitis B. You might also need a vaccination for Japanese Encephalitis and Rabies if you plan to visit rural areas in Thailand or you will be spending a lot of time outside. Talk to your doctor about taking medication to prevent malaria, depending on where you go in Thailand. The currency of Thailand is the Baht. Most of the time cash is used in the small restaurants and shops, but major credit cards are accepted in large shops, supermarkets and hotels. In some shops you will be charged 3-5% extra for using a credit card. Keep in mind that in Thailand it is illegal to show disrespect to the King. Since the bills and coins have a depiction of His Majesty on them, it is important to show respect to the currency. Defacing or degrading an image of the king is considered extremely offensive in Thailand and could get you in trouble.